Masiphumelele means “We will succeed” in Xhosa. This spirit of endurance was needed by the people for decades - and these words are still an expression of their hope of better times to come. In the early 1980’s a group of 400-500 black people started the first informal settlement close to where Masiphumelele is today - in the bushes around that area where today the huge Longbeach shopping mall is located. Under Apartheid laws these families were repeatedly chased away by force. Later they were told that this area was for black people only to work, but they had to live in the poorly set up township of Khayelitsha, more than 30 kilometers away. Especially those people who had found some work in the Fish Hoek area tried again and again to move back to their former homes. Only after Apartheid had ended a group of people from Khayelitsha, joined by a few thousand people from the Eastern Cape who hoped to find work in the Western Cape, started again in 1991/92 to set up their own community at the area which was then known as “Site 5”, but was renamed Masiphumelele by the people soon after. 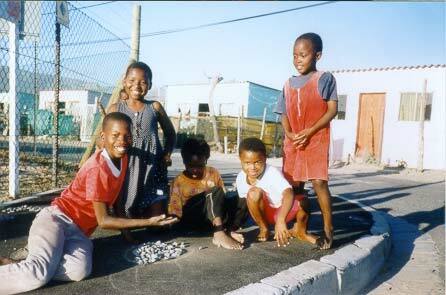 In the early 1990 about 8000 people built their shacks and simple homes and started to set up their own community. Until 1995 there was not even an own building for a school or a clinic. Today more than 26,000 people live in Masiphumelele. There is still no police station in Masiphumelele and just one private doctor. A dedicated staff of nurses with a few visiting doctors works in one Day Care Clinic. The primary school is attended by almost 1000 learners and the high school by more than 600 learners. Compared to others like Khayelitsha (close to a million people), Masiphumelele is one of the smaller townships of the Western Cape. There is a lot of movement between families who partly live in Masiphumelele and partly in rural areas of the Eastern Cape. One of the problems is crime, another that many families have not enough food for their children. Many houses are very poor and especially during the winter months the living conditions are extremely hard. According to research data from pregnant mothers the infection rates of HIV/AIDS and TB are very high in Masiphumelele and are estimated at 30% to 40%.